We've had a lovely weekend of good food and good times. We enjoyed some outings and achieved a few missions also. I've just finished putting together a small hamper as a thank you gift, which was on my to-do list for this week. I made a larger basket last year. It was all our produce or items made from home-grown ingredients. I've "cheated" a bit today as the shortbread is made from purchased flour, sugar and butter! Not long after moving into Hamby Home(in)stead I drove to a nearby small town and while exploring their shopping centre, I picked up a stack of these presentation boxes - for 10 cents each! What a bargain! They are a great size and I've used several so far, stuffed with nicely arranged home-made goodies. This one has shortbread, a jar of fruity chutney and two packets of fig paste. We'll deliver our Hamby Hamper tomorrow with a large tub of Paroo honey. Nick and I were quite broke when we first got together. 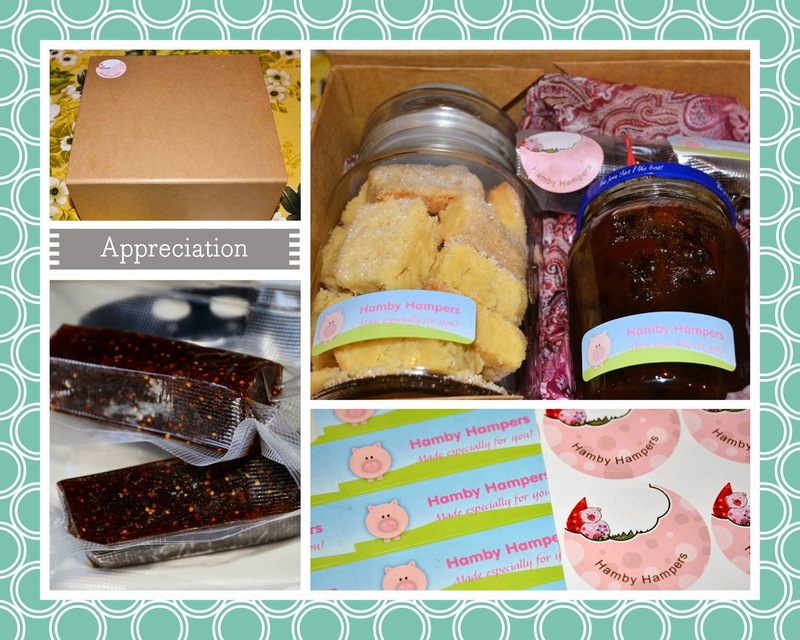 "Hamby Hampers" was devised during one of our early Christmases, when we were expected to purchase gifts for a large family gathering. Back then, I did the labelling with clip art and our home printer. These days I take advantage of Vistaprint's excellent service (and specials) for more schmick presentation!